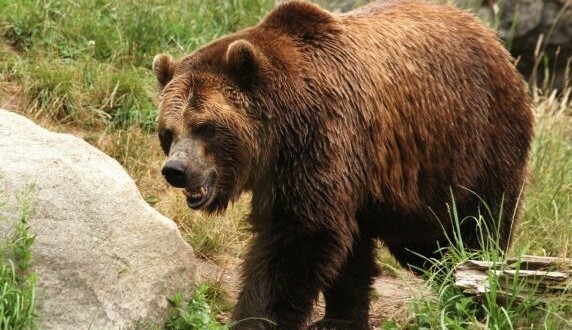 A 57-year-old woman drove herself to a hospital after she was mauled by a brown bear in Alaska, state troopers said Wednesday. Thea Thomas was hiking on Tuesday along the Heney Ridge Trail in Cordova, a remote and sparsely populated coastal fishing community southeast of Anchorage, near a stream in which salmon were spawning when two dogs she had with her ran ahead. The dogs soon sprinted back to her chased by a bear, which she estimated to be between 6 to 7 feet, reared on its hind legs. She told the Alaska Dispatch News she was bitten about seven times, the worst to her back and inner thigh. Thomas returned to her truck, some 1.5 miles away, after the attack, according to a report by Alaska State Troopers.